The SCG Innovation Fund (SIF) was launched in 2015. It's aim is to fund short innovative pump-prime projects to see whether ideas are viable for longer-term research and sponsorship. Every year 10 or more such projects are funded. Chris is a Professor of Inorganic Chemistry. There are three main threads of research in the Timmel group – Electron Spin Resonance, Spin Chemistry and Photochemistry. These threads intertwine, and many of the research projects draw on more than one of these areas. Our Research Group is hosted here, with our research interests. Grant was an undergraduate and DPhil student at Trinity College, Oxford. After winning a prestigious Royal Society Fellowship, he is now a University Lecturer in Physical Chemistry, and is a Tutorial Fellow in Chemistry at Worcester College. Research in the Ritchie group applies optical techniques to explore and exploit the way light interacts with matter. Our experiments include spectroscopic analysis of gases, photolysis, and reaction dynamics, as well as manipulation of colloidal systems using optical tweezers. Research in the Goicoechea group is primarily focused on the chemistry of main-group elements in unusually low oxidation states, p-block species exhibiting multiple bonds, and transition-metal organometallic complexes. Our interests range from traditional coordination chemistry to the chemistry of nanometric molecular systems, and we are particularly fascinated by compounds which fail to obey conventional bonding paradigms. The common feature to all of our research is that it involves the synthesis of previously unknown molecules and solids. We are interested in compounds of the main-group elements in unusual oxidation states, p-block species exhibiting multiple bonds, main-group clusters and transition-metal organometallic compounds. We are particularly fascinated by molecules that defy conventional rules for bonding and that exhibit unusual reactivity. Our current research can be divided into three main categories: (1) Organophosphorous chemistry; (2) Main-group and transition-metal cluster chemistry (3) Organometallc chemistry: Ditopic cabanionic NHC and redox-active ligand systems. 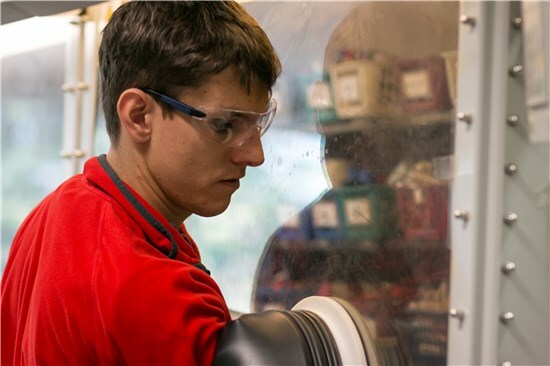 Research in the Clarke Group is to synthesise new solid state compounds and correlate their chemical and physical properties with their compositions and crystal structures. Many technological developments are driven by the discovery of solids with particular magnetic, electronic or chemical properties. The compounds we make may also be desirable model materials with which to test theories in condensed matter physics. Stuart Mackenzie is a Professor of Physical and Theoretical Chemistry. Our group research interests span gas-phase spectroscopy and dynamics and spin dynamics in protein systems. In particular, we use a combination of experimental and computational approaches to study the structure and chemical reactivity of isolated transition metal clusters as models of active sites on heterogeneous catalysts. In other projects we develop cavity-enhanced absorption techniques for the study of dynamical phenomena in condensed phase and at interfaces. Much of the latter work is aimed at identifying the chemical basis for magnetosensitivity in animals. Timothy is a Professor of Organic Chemistry. Our research interests are in synthetic organic chemistry and the contribution that this science can make to the fields of medicine and natural products. We concentrate on developing new methodologies for synthetic organic chemistry and asymmetric synthesis and then employing our chemistry to make biologically-important natural products. Zoe Turner: Biodegradable polymer synthesis using a non-toxic heavy metal. Michael Booth: Light-activated small interfering RNA. Nichola Farrer: Synthesis of multi-modal epigenetic PtIV prodrugs for diffuse intrinsic pontine glioma (DIPG). Andrew is a Professor of Inorganic Chemistry. We are a materials chemistry group with a healthy disregard for traditional subject boundaries. Our particular interest is in understanding and exploiting structural flexibility and disorder in functional materials. Dirk Aarts is a Professor of Interfaces. Research in our group aims at a better understanding of interfaces by studying colloidal interfaces. Recent developments in colloid science, which include new chemical synthesis techniques that allow exquisite control over the size, shape and interaction of particles and new physical measurement techniques such as confocal microscopy and laser tweezers, have opened up a host of exciting opportunities to study interfaces with unprecedented accuracy and control. Areas covered include; Particle development and development of colloidal molecules; Development of a colloidal surfactant system; Flow of complex fluids in microfluidic channels; Hydrodynamic instabilities at the particle level; Demixing and phase behaviour in confinement; Transport through capillary wave zones; and Rigidity of colloidal interfaces. We collaborate with the Dullens group to form the Oxford Colloid group, where we investigate a wide array of key problems across the soft matter and colloidal sciences. Projects include colloidal physics, colloidal chemistry, food science, microscopy, and biology. Here are our combined groups research interests and our publications. Fraser Armstrong is a Professor of Chemistry looking at biological chemistry, bioenergetics and the mechanisms and exploitation of enzymes related to energy production. Research in our group looks at: applications of chemical biology to future energy technologies; protein film electrochemistry and other physical techniques for studying and exploiting metalloenzymes; enzymes as electrocatalysts; the chemical basis of hydrogenases and biohydrogen; enzymes and nanoparticles; enzyme-based Fuel Cells; reversible electrocatalysis of CO2 activation; and the Electrochemical Leaf for Enzyme-catalysed Organic Synthesis. Our various research projects investigate and exploit the important and exquisite reactivities of redox-active sites (Fe, Ni, Cu, Mo, flavin) in enzymes. We are applying a range of powerful physical techniques, particularly protein film electrochemistry (PFE) along with synchrotron x-ray diffraction and EPR spectroscopy, in conjunction with enzyme engineering using molecular biology methods. Our Research Group is hosted here, with our publications. John is a Professor of Inorganic Chemistry. The group's research interests focus on the electronic structure of inorganic systems. We apply a variety of computational methods to a range of problems drawn from both transition-metal and main-group chemistry. The vast majority of our work involves close collaboration with experimental groups involved in the study of electronic structure, magnetochemistry, electrochemistry and reactivity. Michael is a Professor of Inorganic Chemistry. Research in the Haywood group focuses on the synthesis and study of novel solids which exhibit unusual electronic and magnetic behaviour. A particular area of interest is the utilization of unusual synthetic techniques and conditions to increase the degree of control and selectivity exhibited by solid state reactions, with a view to undertaking the directed synthesis of ‘designed’ solid-state compounds. Roel Dullens is a Professor of Physical Chemistry looking at synthesis and characterisation of colloidal model systems, laser tweezing and interfacial distortions. In our research group colloidal suspensions, where particles on the order of 1 mm (the colloids) are dispersed in a solvent, are studied. Colloidal systems are highly interesting and relevant, as they find numerous applications in several industrial branches such as coatings, food, cosmetics but also in more technical applications as photonic crystals and data storage devices. In addition, colloids are widely accepted as a versatile model system for atoms and molecules as their phase behaviour is analogous to that of atomic and molecular systems; they display rich phase behaviour involving colloidal ‘crystal’, ‘liquid’ and ‘gas’ phases. The typical colloidal length and time scales, i.e. micrometers and seconds, make it possible to directly observe colloidal particles in real-space and real-time using video- and/or confocal microscopy. Advanced colloid chemistry techniques are available to tune the chemical and physical properties of the particles or even to develop completely new and unique colloidal model systems. In addition, colloidal systems are easily deformed and manipulated using external fields such as optical laser tweezers. We collaborate with the Aarts group to form the Oxford Colloid group, where we investigate a wide array of key problems across the soft matter and colloidal sciences. Projects include colloidal physics, colloidal chemistry, food science, microscopy, and biology. Here are our combined groups research interests and our publications.